I've cooked on The Big Easy® Smoker, Roaster & Grill several times over the past week. Despite my early misgivings regarding the overall build quality of this unit, I will say that its performance has definitely surpassed my expectations. You may recall that my first cook was roasting two chickens. This was clearly a success, but it only tested one of the three cooking methods that this unit boasts. Last night I decided to try filling the supplied chip/pellet box with some Jack Daniels pellets while grilling some steaks. My thought was that the smoke would give me a more authentic grilled flavor. I fired The Big Easy up and let it preheat on high for 15 minutes. I put a grill surface thermometer on the stainless steel grate (seasoned earlier) and, as you can see, it hit 525º. 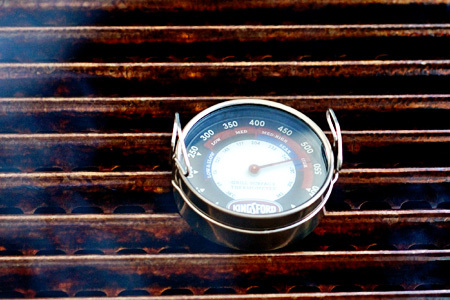 This is a good temperature for grilling. I have to admit that I was pleasantly surprised at how much smoke this thing produced. It was almost overwhelming for what I was after. You can easily get 75-90 minutes of smoke from one load of pellets. I don't know how chips compare, but the manual states that you can expect about an hour. I cooked the steak to medium-rare, and the flavor was outstanding. The heat was consistent and about as even as one could expect. Tonight I cooked several more steaks, minus the smoke box, and the results were equally impressive, as the picture at the top of this post attests. I will say that the more you load up the grill grate, the less impressive the grill marks. My verdict on this unit is that it is great for those that want an easy-to-use cooker that will allow them to grill, roast and smoke. In short, I think it lives up to its name. It's simple to use and produces good food with very minimal fuss. The downside is that its grilling capacity is limited, with a grate that is only a 15" in diameter. I stumbled on your site as I am prepping for my 2nd competition this next weekend. Looking for tips and advice to make things smoother, I found your site extremely helpful... and funny. Thank you. I love how pit masters have been so helpful to us newbies and you definitely fit the bill. Thanks for the kind words, Stephanie! I remember my second competition all too well, so I know what it's like to be where you are. I really enjoy "giving back" wherever and however I can. Hiya Daddio - when grilling on the Big Easy Smoker, Roaster, Grill you do need to pre-heat the grates. You're cookin' with a combination of infrared and the hot metal --- get's pretty darn hot for a little cooker doesn't it? My reactions to this cooker were nearly identical to yours. I kinda chuckle when I acknowledge it's become my "go to" grill for everyday cooking or simple after work chicken, pork loin, etc. roasting. Saturday Evening Post cover shot of a turkey when it's done! CB - Preheating does help to get a nice sear and those pretty grill marks when grilling, doesn't it? 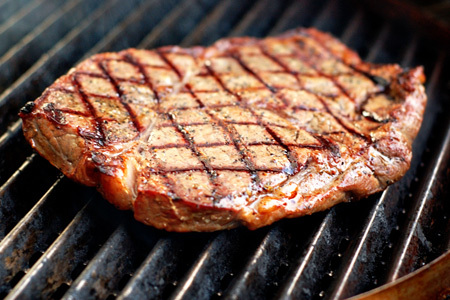 I can't see how putting cool meat on a cool grate would produce those within the few minutes that the steak is cooking. What would you estimate the cooking surface area as being? Thanks! It's a 15" grate, so the area is 177 square inches (pi x radius squared). I got The Big Easy for fathers day and my first time cooking I seasoned it like the instructions said and when I was cooking my chicken it got stuck to the grill grate and I had alot of black mess on my grill grate. Have you had this problem? Do I need to be spraying some oil before I cook each time to keep this from happening? No, I didn't experience that. 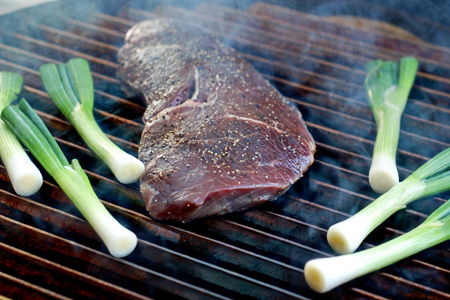 Of course, you should expect some black char on the grates with any kind of grilling or roasting. So where can I find one of these bad boys? It looks like there all gone. Ronald - I don't know, but I no longer recommend this cooker. Mine rusted terribly and literally fell apart less than a year after I received it. I do highly recommend the Pit Barrel Cooker.